Two weeks ago, I was intrigued by Akoss’ post on VANISHED by Sheela Chari. 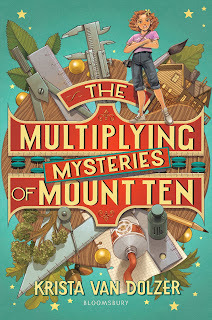 A middle grade book about a mysterious instrument? Plus, I love this cover. I had to read it! Eleven-year-old Neela dreams of being a famous musician, performing for admiring crowds on her traditional Indian stringed instrument. Her particular instrument was a gift from her grandmother–intricately carved with a mysterious-looking dragon. When this special family heirloom vanishes from a local church, strange clues surface: a teakettle ornamented with a familiar pointy-paced dragon, a threatening note, a connection to a famous dead musician, and even a legendary curse. The clues point all the way to India, where it turns out that Neela’s instrument has a long history of vanishing and reappearing. Even if Neela does track it down, will she be able to stop it from disappearing again? 1. The culture – It was interesting to read from the point of view of a young girl who has grown up American but steeped in Indian culture. I liked how her parents encouraged her to be both and how that made her into the girl she is. It was also interesting to see how that played out differently with her best friend, Pavi, whose parents were more traditional. 2. The authentic middle school experience – There were a fair amount of scenes at school, and I recognized the characters. The popular girl. The follower. The girl marching to her own beat. The wise-cracking boy. But while they seemed familiar, they didn’t become stereotypes. It was more than the characters, though. It was the way Neela viewed each of them and how her interactions with them changed throughout the book that seemed so real to me. Middle school is a time when friendships change in so many ways. Sheela Chari really captured that. 3. The mystery – This book was nominated for an Edgar Award, so that should give you a clue that the mystery is well-done. It was a rather slow-paced book, which is different from what I typically read, but I liked the way the mystery unfolded slowly over several months. That’s probably how it would happen in real life, after all. It was the type of mystery that the reader could piece together along with Neela. There wasn’t a huge twist at the end, but the clues were handed out slowly enough to keep the reader from solving the mystery too soon, either. 4. The music – Well, I said that was one of the reasons I decided to read this book. I enjoyed experiencing the music through Neela, from her stage fright to the way she shared it with her little brother. As an instrumentalist, I understood her connection to her veena. I know it feels strange for me to play on a violin other than my own. 5. Neela’s growth – Neela’s character arc was very well-done. She grew in a number of ways throughout the book. I enjoyed watching her figure out who she wanted to be and what she believed about right and wrong. She had to make a number of decisions that would define her future. I liked experiencing that with her. So, has anyone else read VANISHED? What did you think? Sounds like a very original story. How would it work as a read-aloud? It would work pretty well, although it is a bit long (over 300 pages). There are Indian words interspersed throughout, although they didn’t strike me as hard to pronounce. Oh I love your review and I’m so happy you read it and enjoyed it as well. I think it’s pretty neat that you connected with Neela’s love of music. This was my first and only MG dealing with a musical instrument. I wonder if there are more out there. That’s a really good question. You know, I wrote a musical MG, but I got feedback that MG readers wouldn’t get the music aspect, and that’s why I aged it up to YA. Mine did go much deeper into the music than VANISHED. I have read a number of YA books with characters who are very into their music, so maybe that agent was right. agreed that the cover is smashing. must take a look! Read it. Loved it. The mystery elements were great and like you I love how she wove in the culture…was seemless. And how COOL on that instrument-needless to say I spent a rather lot of time on you tube looking it up, listening, enjoying. Research for when I did my book talk on it…lol! That is actually true, just probably didn’t need to spend that much time. Thanks for the feature on this! You know, it didn’t occur to me to go listen to a veena online. I’m pretty sure I’ve heard one before, but you’ve inspired me to investigate further! I have not read Vanished yet- but it is on my list. It sounds SO good and I can’t wait to try to figure out the mystery. 🙂 Great review!